The Onyx Reserve line of cigars are robust square-pressed premium cigars hand-made in the Dominican Republic. Featuring a unique blend of Cuban seed Dominican, Peruvian and Nicaraguan tobaccos wrapped in a dark, oily Connecticut Broadleaf Maduro wrapper that has been additionally aged and fermented for extra rich flavor. These cigars are medium to full bodied with creamy smoke and a sweet finish. 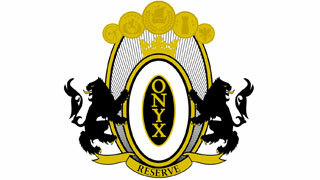 Onyx reserve continuously earns high appraise and has been rated a “94” by Cigar Aficionado.